The word “savage” has been used for centuries to justify a group of people entering a foreign land and claiming its resources as its own. The word dehumanizes the native people, excusing the true savagery of those who take what is not theirs by any means necessary. The new Vault Comics series These Savage Shores explores this idea by bringing a London vampire to the coast of India during the early days of the British East India Company’s rule of the territory. With its period horror pitting colonial forces against the myths and monsters of the lands they invade, the book is reminiscent of Image Comics’ Manifest Destiny. But Vault’s series spends much more time with the native culture, showing readers a side of the people often dismissed by the “savage” label. 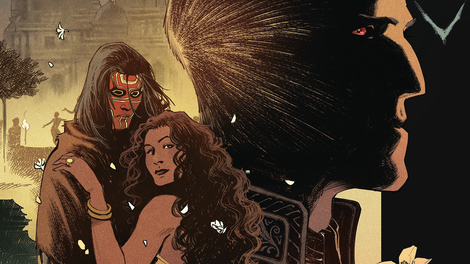 Written by Ram V with art by Sumit Kumar, colors by Vittorio Astone, and letters by Aditya Bidikar, These Savage Shores #1 contrasts the beauty of India with the terror of London, introducing its Indian leads in a scene of tenderness and natural splendor before jumping to dark, dingy London for vampire terror. A hummingbird sips nectar from a flower as lovers talk under a tree, the woman’s thick dangling hair connecting her to the foliage that hangs above them. The softness of this first page sets a warm, inviting tone that is replaced by cold tension when the vampire becomes the focus. The story jumps between these two threads until they eventually converge in a cliffhanger twist that upends expectations of what this narrative is going to be, revealing that the native culture has its own darkness that is awakened when its people are threatened. The nine-panel grid has a reputation for density, but These Savage Shores finds ways to make it feel open and loose. This structure grid is extremely flexible, and the creators take advantage of the opportunities it provides for the passage of time, movement through space, and establishing different levels of scale for each panel. Kumar blends detail, dynamism, and multidimensional character acting in his linework, with Astone’s coloring highlighting the tonal shifts and enriching the texture of Kumar’s inks. Having worked with Kumar on Ruin Of Thieves for Action Lab, Ram V knows how effectively his collaborator can create an immersive environment with a distinct atmosphere, and the textless scene-setting sequences play an integral part in drawing readers into this world. A stand-out page of this first chapter depicts Alain’s burning at the hands of a vampire hunter in a nine-panel layout that doesn’t follow the typical flow of the grid. It begins with the usual: a row of three panels breaking down individual moments from different angles, read from left to right. But things change with the last panel, which has the hunter reaching his torch toward Alain, breaking out of the border to indicate a significant shift in the structure of the page when Alain catches fire in the panel below and rushes away from the door, moving right to left. Alain’s sprint is presented in two rows of three panels that combine to create a single larger image, with each individual part showing how the flaming Alain moves through space. It’s just one example of how this team uses conventional tools in inventive ways, making bold choices that intensify the story’s forward momentum.